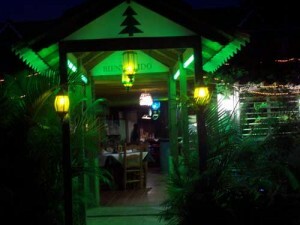 The Churrascaria Norcineria Steak House is the restaurant located on the property of the Los Pinos Hotel (or Residence Los Pinos) in Las Terrenas which in in Samana located in the North East portion of the Dominican Republic. Churrascaria Norcineria is an open air restaurant (pretty typical in th DR) with a pleasant atmosphere and a friendly staff. You can also sit out in the garden area to have your meal or to have a drink. Prices range from about $9.50 USD per plate to about $20.00 USD with the majority being around $14.00 USD. The menu was huge, including specialty pages with Italian food (I believe the owner is from Italy), imported steaks (Dominican beef has a tendency to be leaner, tougher, and a less flavorful than imported beef), Sea Food and a wide variety of other choices. Prices very with prices ranging from about 350 pesos to about 750 pesos. We chose the Shrimp and Fried Squid (yes, that would be calamari) for 500 pesos (about $15 USD). My wife was impressed enough to order that again the second night. I picked the Camarones a la Plancha (450 pesos) the second night. These are large whole shrimp sautéed in the shell. Perhaps I just don’t get out much; this was a little different for me. The heads, legs, and everything else are still attached. I tackled the meal by breaking the head off, cracking the shell with my fingers and pulling the meat out. I would consider this to be a little more adventurous meal. The food was high quality and the portions were good, most of the meals seem to include the buffet with has a variety of different foods, some Dominican others that seem to have more of an Italian influence (hard to say, I didn’t recognize many of the dishes). Also a small lemon liquor was provided with the meal, which I thought was very good. While the front of the restaurant showed an advertisement with a very large number of different deserts, only two were available. One happened to be the one my wife was looking for so we were happy. We shared a Tiramisu, which was excellent and cost 200 pesos (about $5.50 USD). They had a well stocked bar and were able to make pretty much anything you can think of. I stuck with a simple well drink a Cuba Libre (rum and coke) made with the local rum which was 150 pesos or about $4.25 USD.